As part of their Sibelius cycle, the BBC Symphony Orchestra included En Saga (A Fairy Tale) and the Second Symphony in this programme. Replacing the scheduled but indisposed Estonian conductor Neeme Järvi on short notice (and making his London debut at the same time), Danish conductor Thomas Søndergård clearly threw himself into the Baltic music of the evening with passion, commitment and genuine success. In the opening piece (En Saga) Søndergård secured the overall structure but the most memorable details for me were the realisation of the rhythmic viola theme, the united viola section as well as the viola solos (by Caroline Harrison) and the beautiful clarinet solo (by Andrew Webster) in the concluding Moderato e tranquillo section. In the opening bars of Sibelius's second symphony (as later in the opening bars of the third movement) the rhythmic design took a while to establish a clearly defined shape but, before long, a magic clarinet solo (Webster) and an unusually sensitive timpani solo (John Chimes) restored the equilibrium. Indeed, the timpani took most of my attention from the second movement on. Chimes practically sings on his instrument when the music so requires, he plays chamber music with the appropriate orchestral sections and he braves all passionate sections with rock solid rhythm as well as dramatic imagination. Full marks to the BBC SO for programming Balys Dvarionas's Violin Concerto and thus facilitating its timely UK premiere. Statistics are not on hand but it is likely that, although composed in 1948, this unjustly neglected work still awaits its premiere in a great many countries in the world. According to Martin Anderson's programme note, it is apparently the first violin concerto by any Lithuanian composer. [Dvarionas (1904-72) was actually born in Latvia but his adult career included extensive periods – as composer, conductor and pianist – in Lithuania.] 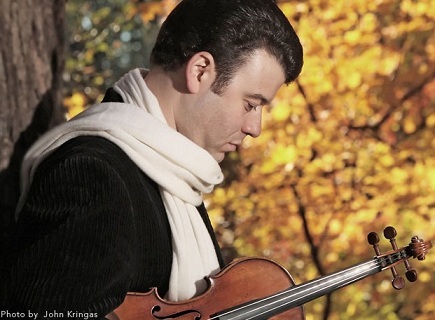 Although busy concert violinist Vadim Gluzman recorded the concerto with conductor Neeme Järvi in 2010 (BIS-CD-1822), this was the first time that he performed it live on stage. And another first – admittedly of less importance but arguably still of significance – concerns my borrowing an evidently brand new copy of the score (published in 1949) from a central university library as the first borrower of the item. The music of the concerto is full of Lithuanian folk melodies and dances (whether original material or folk-inspired) as well as lush orchestral writing for the tutti interludes. Composed clearly as a concerto (rather than a concertante) for violin – which has to negotiate extensive solo passages such as the unusually long composed cadenza in the first movement – it was a wise decision to employ a slightly reduced symphony orchestra to partner the solo violin. Structured in three movements, one could term the form as a neo-Romantic violin concerto. However, in Gluzman's hands the piece is about astonishingly beautiful songs, spirited rhythmic dances and effortless but spell-binding virtuosity. Although over sixty years ago the concerto was edited and performed by David Oistrakh, the pairing of Dvarionas and Gluzman now seems to me as the sole perfect match. Conductor Søndergård, who learnt the piece within a few days for this concert, gave full support (although I would have a preferred slightly more defined rhythm in the opening). There was further support from guest leader Tomo Keller (who shaped his orchestral phrases with intelligence and inspiring authority), from the very sensitive clarinet solos (by Andrew Webster) and, indeed, from the whole orchestra. Gluzman looks and sounds as the most natural player; 'a fiddler on the roof' in the best sense of the folkloristic description. In his encore – Gavotte from Bach's E major partita – Gluzman slightly surprised me with his elastic treatment of the notated rhythm but this was clearly an informed decision with a transparent polyphonic insight and immense humour. The audience realised that they were listening to something extraordinary: you could have heard a pin drop in the auditorium. I rarely come across such a large body of people so silent and attentive. This is the first time that I heard Dvarionas's violin concerto, and it is likely that a substantial part of the audience heard it for the first time too. We were not disappointed.